There was a time, way back in 2009, when the constant kvetching and complaining about what constituted “real” Black Metal – mostly fuelled by a bunch of obnoxious elitists online desperately trying to portray themselves as the true heirs to a half-baked ideology cooked up by a bunch of disaffected Norwegian teenagers – started to take a real toll on my ability to appreciate it. More and more it seemed that, despite being long associated (in my mind at least) with creative freedom and primal emotion, the Black Metal scene was becoming just as ignorant, insular, and cluttered with impotent keyboard warriors and perpetual adolescents, as any other. Thank God Satan for Necrophobic then, who swept in at just the right time to help reignite my passion for the genre. Here was a band who had not only paid their dues (with interest) but who had, alongside their early contemporaries in Dissection, Dawn, etc, practically helped write the Black Metal rulebook. And although this wasn’t my first exposure to the group (2002’s Bloodhymns was my first encounter with them, and still remains my favourite out of all their releases), it was Death to All which firmly hammered home how little Necrophobic actually gave a damn about issues of ideological purity or the arbitrary standards imposed by the genre’s self-appointed gatekeepers, and how much better they were than 99% of their contemporaries as a result. So when I found out that 4/5s of the line-up which wrote that album – along with returning vocalist Anders Strokirk, whose first (and last) appearance with the band was on their legendary debut The Nocturnal Silence – were getting together to compose the band’s long-awaited eighth record, you can perhaps imagine how excited I was. 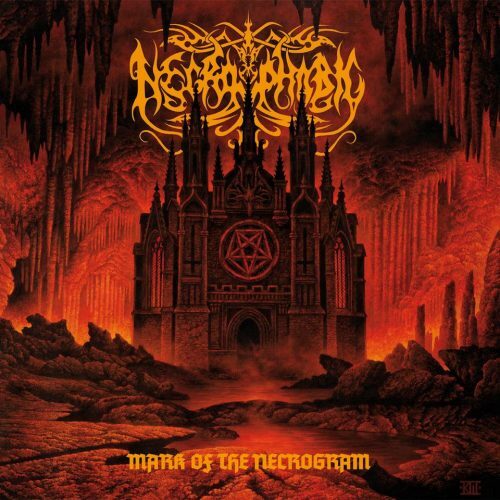 Well I’m happy to report that Mark of the Necrogram is an undeniable triumph, packed to the rafters with massive, insidiously melodic riffs, shamelessly extravagant solos, and riveting, rock-solid grooves… not to mention a seemingly endless array of humongous metallic hooks big enough to hang an entire bull’s carcass from. Tracks like the blast-happy, riff-heavy title-track or the neck-wrecking thrash attack of “Odium Caecum” immediately showcase the reborn Necrophobic firing on all cylinders (especially Anders Strokirk, who sounds like he hasn’t missed a step at all in the intervening years), mixing the wisdom and experience of a veteran act with the vim and vigour of a much younger band, while also continuing to channel some of the same proggy proclivities which underpinned many of the tracks on Death to All, drawing influence not just from the bleakest, blackest ends of the metallic spectrum, but also from the very darkest side of the moon. And while instrumental closer “Undergången” does end things on a slightly anticlimactic note when compared to the dramatic, decisive strains of its predecessor “From the Great Above to the Great Below”, ultimately this is only a very minor quibble on what is an otherwise astoundingly good album, and really shouldn’t spoil anyone’s overall enjoyment or appreciation of the record… particularly when they have killer cuts like the tempestuous “Lamashtu”, the monstrously groovy “Requiem for a Dying Sun”, or the irresistibly infectious “Tsar Bomba” (which is already a front-runner for my favourite song of the year), to get their teeth into. In the end Mark of the Necrogram proves that there’s no-one quite like Necrophobic when it comes to delivering the goods. So let all the pompous pretenders and patronising posers beware… the true kings are back! Well after reading your review I’m seriously excited. Death To All was my first exposure to Necrophobic and still holds up as one of their best. If the new album is anywhere near that sort of quality I can’t wait to check it out. The songs that have been released have sounded great, so I’m hoping that there’s something that hits me the same way songs like Revelation 666, La Santisima Muerte or Temple of Damnation did the first time I heard them.